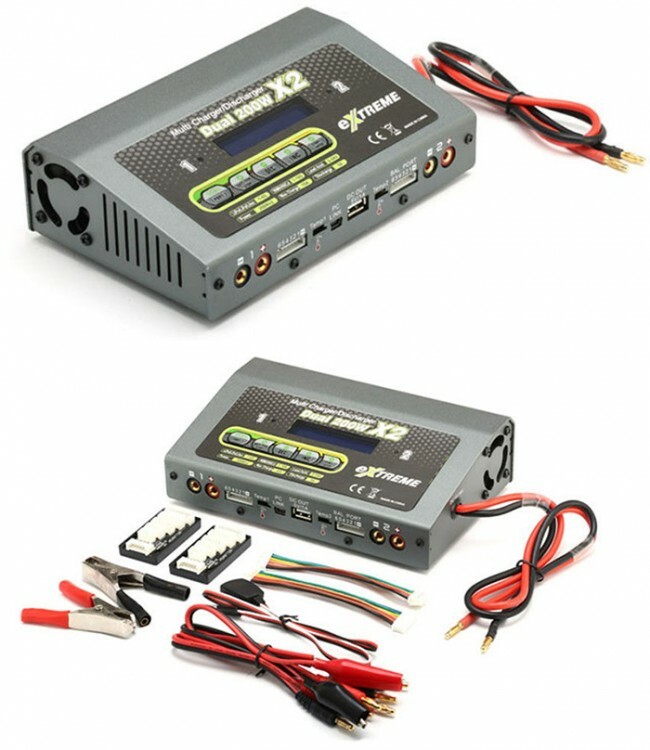 The Extreme dual 200W DC charger is an excellent choice for those looking for a charger capable of charging 2 packs simultaneously at up to 200W and 10 amps per channel. Every operating program in the unit is controlled with mutual links and communications to prevent every possible error, so it introduces the maximum safety, such as input voltage warning. reserve polarity protection and Lithium cell-count input error warning. It employs the circuit that features dual output power of 200Watts each. Total output power is 400 Watts. As a result it can charge or discharge up to 18 cells of NiCD/NiMH and 6 series of Lithium batteries with maximum current of 10A. Furthermore the cooling system is so efficient that can hold such a power without any trouble of running the CPU or the operating program. It has an individual-cell-voltage balancer inside. This does not requires any extra balancer separately when charging Lithium batteries(Lilo/LiPO/LiFe) for cell voltage balancing. It also can monitor and balance individual cells of the Lithium battery pack during the discharge process. If the voltage of any one cell varies abnormally, the process will be stopped with the error message. You can charge Lithium battery for special purposes. "Fast" charge reduces the charging time of Lithium battery and "Storage" mode controls the fnal voltage of the battery to be suit for long time storage. The USB power supply can provide 5V, 1A continue current. You can power your mobile phone, digital camera or even your IPod via the USB power supply.